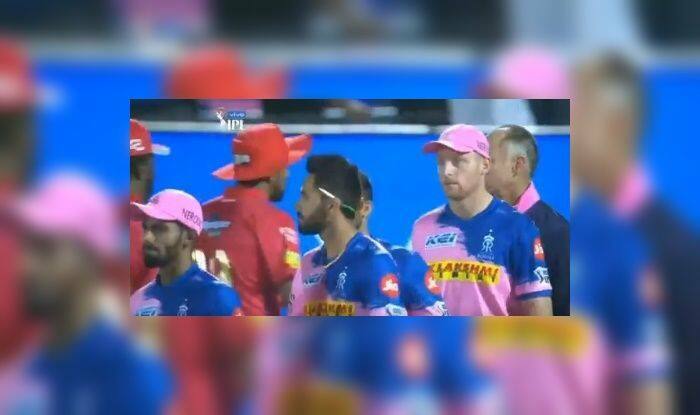 Jos Buttler avoided eye contact with the Kings XI skipper after he became the first victim of ‘Mankading’ in the history of the cash-rich IPL when a desperate Ashwin, dismissed the batsman in a controversial manner. Ravichandran Ashwin has been facing a lot of flak on social media following the ‘Mankading’ incident, of which Rajasthan Royals’ opener Jos Buttler was the victim. Following the match in the post-match customary handshakes session, the England international was evidently seen avoiding eye contact with the Kings XI Punjab skipper. The incident has sparked outrage on social media with veteran cricketers, pundits, and fans weighing in with their take. Several also urged the IPL chairman to take suitable action against the match referee who gave the decision, and Ashwin. However, Ashwin feels he was completely within his rights to carry out a dismissal of such nature, which completely turned the match in Kings XI’s favour and clarified there was no argument between him and Buttler. However, the video clearly suggests what Buttler made of the incident. “No real argument on that and it was pretty instinctive. I didn’t even load and he just left the crease. We ended on the right side of the coin, but I definitely think that those are game-changing moments and batsmen need to be wary of it,” Ashwin said after Kings XI beat Rajasthan by 14 runs. “We all know that after six overs it is going to slow down. Credit to bowlers on how they bowled. I have been working on a lot of variations, pretty happy that it came out,” he said. “We are not supposed to comment on a controversial issue. The match referee will take the call. We will take the decision sportively,” he said when asked about the dismissal. “I thought we were batting really well. We started off well at the top and then got another good partnership. Later on we needed 39 off 4 overs and we thought that could have been done easily,” he said.